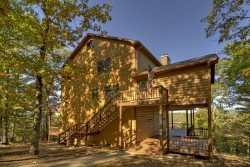 This cozy cabin offers maximum privacy and is only 8 miles from downtown Blue Ridge. After a day of your favorite activities, retire to your home away from home. Put some bar-b-que on the grill before slipping into the 6 person Hot Tub situated on its own separate deck. Each of the cabin’s three levels has a comfortable bedroom with bath and meal preparation is easy with a well-stocked kitchen. Entertain your family with the air hockey table or the Sony PS4 before settling into your theater chair in front of the 65 inch HDTV in the downstairs viewing room. If you would rather relax, just warm your toes by the wood-burning fireplace or nestle into a comfortable chair on the screened porch with a beverage and enjoy the peace and the quiet. No matter the season, this adorable cabin will provide warm memories of your family gatherings for years to come. Amenities: Screened Porch, Hot Tub/Jacuzzi, Dishwasher, Washer, Dryer, Phone, Microwave, Coffee Maker, Satellite TV, DVD, Gas Grill, Stereo, Outdoor Fire Pit, Home Theater room with a 65" with comfortable seating and a old fashion popcorn maker.